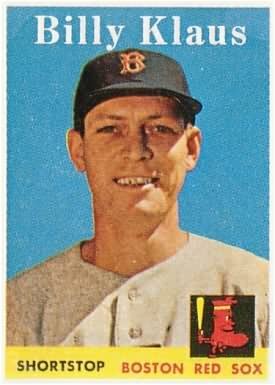 After toiling in the Minor Leagues for seven seasons, Billy Klaus (no relation to Santa) got his break when Pinky Higgins replaced Lou Boudreau as Red Sox Manager after the 1954 season. Prior to getting the top job with Boston, Higgins had been managing in Louisville for the Red Sox’ affiliate in the American Association. In 1953, Klaus found himself playing for Toledo (Braves) in the same league. Higgins began noticing that whenever his Louisville team played Toledo, this Klaus guy would find a way to beat him. So when the Red Sox starting shortstop Milt Bolling dislocated his arm during Boston’s 1955 spring training season, Higgins brought Klaus into camp and told everybody who would listen that the Spring Grove, IL native could be Boston’s new starting shortstop. As Klaus himself later put it, he had always found himself stuck in organizations that had better players already entrenched at his position. When he was with the Braves, he played third and they already had Eddie Matthews. The Giants moved him to short but New York already had Alvin Dark. But once Bolling went down and Higgins gave him the break he needed, Klaus took advantage of the opportunity. He hit .283 for the 1955 Red Sox, smacked 153 hits and scored 83 runs, while playing solid defensively at short. He sparked that Boston team to a 15-win improvement from the season before and finished second to Cleveland’s Herb Score in the Rookie of the Year voting that season. Klaus followed that up with a strong second season in ’56, hitting .271 and scoring 91 runs. But he began to slump offensively the following year and by 1958 had pretty much stopped hitting all together, losing his starting position to youngster Don Buddin, in the process. That December, Klaus was dealt to the Orioles for outfielder Jim Busby. Billy hung on in the big leagues until 1963. His career average during his 11-season career in the Majors was .249. His younger brother Bobby played a bit for the Reds and Mets in the 1960s. Billy Klaus was born on December 9, 1928 and died from lung cancer in 2006.